BAWTRY & District AC (pictured above) upstaged the pre-match favourites and netted the <?xml:namespace prefix = st1 ns = "urn:schemas-microsoft-com:office:smarttags" />UK‘s most important Team title and £1,764 in the Embassy Division One National Championship on the Stainforth & Keadby Canal on Saturday (July 26). A total of 68 teams of 12 anglers took part in this Blue Riband competition. And a late change of tactics earned the Individual trophy for Tony Hopley, a 59-year-old retired headteacher from North Wingfield, near Chesterfield, with a weight of 8.190 kg. Tony, who fishes for Matlocks AC, went home with £3,083 from the Individual Pools and a £5 each way bet. Sadly, this National marked the end of Imperial Tobacco’s record-breaking 34-year run of backing angling following the Government’s decision to stop most tobacco sponsorship by July 30, 2003. It was the longest-running sponsorship in British sporting history. Local aces, Daiwa Goldthorpe, Barnsley & District, Middy Team Dons and Colmic Ossett, were installed as the most likely winners but it was another local Yorkshire team, Bawtry, who produced the perfect performance to storm to victory with 680 points – a stunning 35 points clear of runners-up Garbolino MAP Starlets AS. It was the first time Bawtry had taken the prestigious Division One title though they did lift the Division Three trophy back in 1982. This was Bawtry’s first season back in the top flight after they had finished second in the Embassy Division Two National on the Boston Drains last year – great news for their new sponsor, Mosella. Bawtry skipper, Dale Murten, a 34-year-old financial consultant from Finningley, near Doncaster, said: “This is an unbelievable result and an incredible performance from the team. We only got promotion last year and, if we had finished in the top 15, we would have been delighted – to go out and win the title is just amazing. “We are a local side and know the water very well but we are not a team of superstars and, obviously, most people would have fancied the better-known local sides to have won this event. “We knew it was going to be hard as the water has been hammered in recent weeks. On the day, it was really hot with bright skies, clear water and, in some sections, it was flat calm. We started on squatts to try for a reasonable weight at 10 metres and then tried to catch a bonus fish with maggot over chopped worm at 14 metres. “We were looking for 1 kg a man and ten of our 12 anglers reached that target. – all the team did really well but we only have a squad of 13 anglers and the unlucky man to miss out was Cantley’s Dave Jones. But Dave took it really well and did a fantastic job for us as bank runner and steward.” At least, things went right for skipper Dale at the match as the previous day he had filled up his diesel car with unleaded petrol! Dale was seventh in C Section with 2.210 kg. Bawtry’s top scorer was Balby’s Keith Dodd, a 22-year-old fishing his first National. 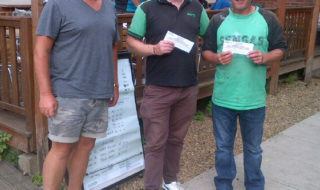 Keith landed three chub on a long pole and maggot to win E Section with 4.500 kg to pocket £1,038. And there’s a special mention for former captain, Hatfield’s John Robinson who was collecting his third gold medal and his 10th National medal – a superb achievement. John won an Individual gold in Division One on the Trent in 1987 and a Team gold with Bawtry in 1982. In addition, Balby’s Andy Paul was fourth in K Section with 2.350 kg and Bentley’s Bill Price was fourth in L Section with 2.840 kg. Garbolino MAP Starlets AS (pictured above), who have been rebuilding their side since last year, totalled 645 points and claimed the silver medals and £1,260 – it was their first National medal for a number of years. England international Darren Cox was deputising as skipper for Mark Downes who was on International duty for England in Portugal. Darren, a 37-year-old senior product manager for Leeda Tackle from Ettington, Stratford-upon-Avon, said: “We have got some great, experienced anglers like Norman Carpenter, Sean Ashby, Mark Downes and Paul Downes and some very good young anglers as well. We have a good blend and we are looking forward to the future with confidence. 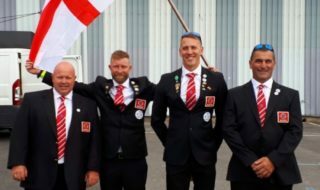 Dudley‘s Vince Gandley was their top scorer, winning A section with 3.610 kg while Daventry’s Adam Rooney, a 22-year-old fishing his first National, was second in C Section with 3.390 kg. Reg led the way with a captain’s performance as he won D Section with five chub and 2 kg of small fish for 4.050 kg and seventh place overall. Their other top anglers were: Steve Donoghue (fifth in L Section with 2.640 kg); Peter Baron (fourth in G Section with 2.750 kg); and Nigel Goddard (fourth in J Section with 2.990 kg). From left to right, Gary Sadler, winner Tony Hopley and third placed Chris Parr. Individual champ Tony Hopley drew Peg J2 and, two minutes before the start, was getting ready to fish for chub under the brambles on the far bank. Then, a passer-by told him it was a bream peg and Tony said: “I was going to fish a worm for chub on a size 6 hook, so I immediately changed over to the tail of a worm on a size 16 hook with chopped worm and casters in a groundbait feeder.” Thirty minutes later, Tony’s decision to change was proved right when he hooked his first bream and, by the end, he had 11 bream up to 1.4 kg, two ruffe, one perch and one roach in his net for a convincing win. Once that first bream was in the net, Tony never even considered the various pole rigs he had set up. A delighted Tony added: “It’s my seventh National but my first time in Division One – it’s just an amazing result for me as you never come to such a big match as this expecting to win. I’m just glad the passer-by told me about the bream. It’s easily my biggest pay day – my previous best was £400.” With eight bream in the net, the bites dried up halfway through the five hour match and Tony did try dropping down to a size 22 with a single red maggot and, in the last hour, switched to a straight bomb. But it was the tail of a worm on a size 16 hook to 4 lb main line and a 2½ lb hook length that proved the most successful tactics. Gary Sadler with his catch. The Individual runner-up, Gary Sadler, a 42-year-old window fitter from Leicester, landed four fine chub – the biggest scaling almost 1.8 kg – and some small gudgeon, roach and perch for a weight of 5.220 kg from Peg L46 at Kirk Sandall. Gary, who has fished 20 Nationals for Leicester Sensas AS and developed his technique at Holly Farm Fisheries at Ashby Magna, Leics, said: “I started off with chopped worm on the feeder but only caught a little perch, so I went on the pole and landed a few more small fish. Then, with two hours to go and the sun going off the water, the chap next to me caught a chub and I decided to see if there were any chub under a tree on the far bank. 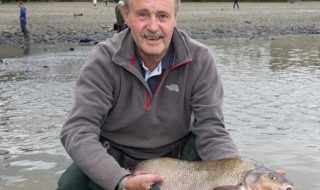 I caught one quickly and then lost another chub next cast before landing three more on double bronze maggots before the end.” He banked £1,921 – beating his previous best of £900. A late 20-minute blitz sealed third place for Chris Parr, a 38-year-old scaffolder from Taunton, Somerset, who was fishing for the Sensas Thyers Match Group. Chris landed nine bream up to 1.4 kg and three perch for a weight of 4.830 kg from Peg B5 to win £1,430 – his biggest match return. Aircraft fitter Barry Thomas (Southport & District AA) landed three chub and some smaller fish to come home fourth with 4.550 kg from Peg K11 to win £1,832 after having a £12.50 each way bet. 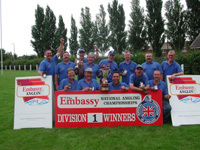 EMBASSY DIVISION ONE NATIONAL ANGLING CHAMPIONSHIP (Stainforth & Keadby Canal) TEAM: 1. Bawtry & District AC 680 pts; 2. Garbolino MAP Starlets AS 645 pts; 3. Middy Team Dons 620 pts; 4. Barnsley & District 606 pts; 5. Tek-neek Trabucco Halifax 583 pts; 6. Drennan North West 579 pts; 7. Daiwa Goldthorpe 572 pts; 8. Walton AC 570 pts; 9. Sun Inn Tuxford AC 556 pts; 10. Warrington AA 555 pts. INDIVIDUAL: 1. Tony Hopley (Matlocks AC) 8.190 kg; 2. Gary Sadler (Leicester Sensas AS) 5.220 kg; 3. Chris Parr (Sensas Thyers Match Group) 4.830 kg; 4. Barry Thomas (Southport & District AA) 4.550 kg; 5. Keith Dodd (Bawtry & District AC) 4.500 kg; 6. Dave Wilshaw (Burton Mutual AA) 4.200 kg.